Lillian Lawrence was born in Alexandria, Virginia on February 17, 1868, however she grew up in San Francisco when her parents moved there when she was only two years old. Her first exposure to the theater was when she was twelve years old as a toe dancer at the old Tiovoli Theater in San Francisco. The following year she was chosen as one of thirty-two children to become a living chess piece as the Queen’s Knight in operetta, The Royal Middy at the Bush Theatre. A love of theater infected her, however her parents were opposed to her going on the stage, but when they recognized how much she wanted it, they conceded. 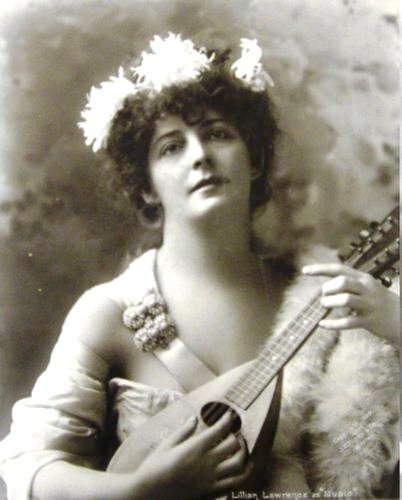 Lawrence remained with The Royal Middy after it was transferred to the California Theatre, and for three seasons she sang in light opera at that house in the company of which Emily Melleville was the prima donna. Then her voice failed, and she took her first engagement as an ingénue in a stock company in Oakland, California, where she remained and learned her craft for two years. She gradually worked her way eastward, affiliating with groups in Dayton, Ohio, and New York, where for years she was prominent in local productions. She eventually arrived in Boston, where she was a leading lady with the Castle Square Stock Company for five years beginning in 1897. She was immediately embraced by the theater-going public. By this time, she had a decade’s experience in major speaking parts, had trained her memory so she had over 100 roles at her command, and had bloomed into a captivating actress. During the first decade of the 20th century she appeared on Broadway regularly. In 1919 Lawrence moved to Los Angeles to live with her daughter, Ethel Grey Terry who made her own niche as a film actress. Lawrence divided her time between films and the legitimate stage where she regularly appeared at the Majestic Theater in downtown Los Angeles. She played in numbers of film roles as power matrons for Universal, Joseph Schenck, and the Talmadge Film Companies. Her last legitimate stage role was with Taylor Holmes at the Playhouse in The Great I Am. 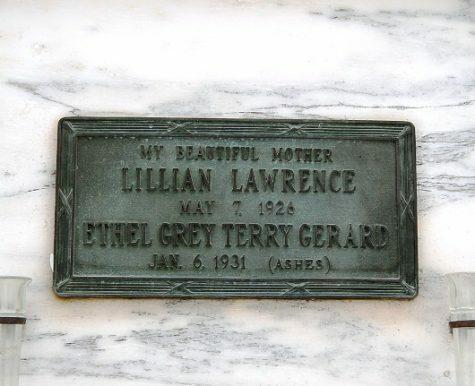 Lillian Lawrence died suddenly of heart disease on May 7, 1926 at her daughter’s home at 610 Alpine Drive in Beverly Hills. Funeral services were held at the Strother & Dayton undertakers on Hollywood Boulevard. Afterward her body was placed in a crypt in the fairly new mausoleum addition at Hollywood Cemetery. Just five years later, her daughter, Ethel Grey Terry died and her ashes were interred in her mother’s crypt. Lillian Lawrence and her daughter are located in Building C, Crypt 308, which is behind the new mausoleum that was recently opened. This entry was posted on Tuesday, February 21st, 2017 at 2:15 am and is filed under Book/Film News, Hollywood Forever Cemetery. You can follow any responses to this entry through the RSS 2.0 feed. Both comments and pings are currently closed. As usual, this was absolutely beautiful– great story and photo.! Is it known whether any of Lillian or Ethel’s films still survive? Thank-you so much for all that you do and share with all of us. Thank you, Allan for giving the lovely Lillian Lawrence her moment in the spotlight again. Such a nice tribute and well deserved.